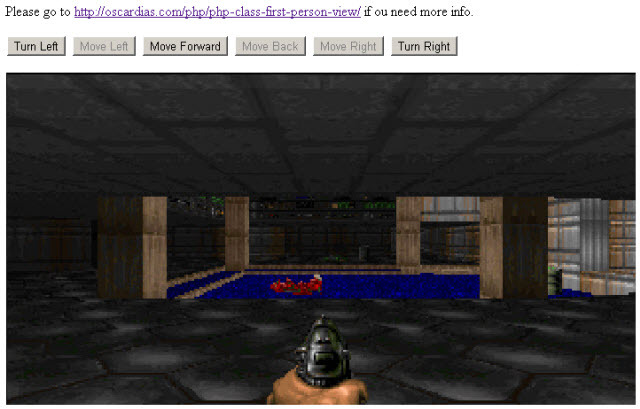 This class can be used to browse images like a first person view game. It takes as parameter the definition of a map virtual place with the positions and images that the user would see on in each place of the map depending on the rotation angle. The class takes the current user position on the map and the rotation angle and determine which image he should be viewing. It can also determine if the user can go ahead, backwards, left, right, turn right or turn left. Prize: One book of choice by Packt First person shooters are games that let the player view the game 3D scene from different points of view and angles. This class is inspired on that concept. It can emulate a virtual world tour by showing a first person view of the world using images that represent the different points of view for each angle that an user may see from each location in that virtual world.